There is now a new tablet from HCL in its Me series. It is called HCL Me V1. It runs on Android 4.0.4 Icecream Sandwich and has a 1 GHz processor. It can also make calls. We see that now tablets have become really popular even in India. This is going to be the first tablet from HCL which will be able to make and receive calls. This tablet does not have great specifications but for a person who wants to make and receive calls with a tablet at a cheap price then HCL Me V1 is the answer for them. The biggest plus point is that it can facilitate a 3G dongle. The flip side is that the sim supports only 2 G . For 3 G connection you will have to get a dongle. Also it does not support the Google play store application. Therefore for applications , one has to totally depend on the HCL app store. We see the specification sheet is not that attractive. However the fact that it is priced at just Rs 7699 and is the latest from HCL makes it a good option for purchase. 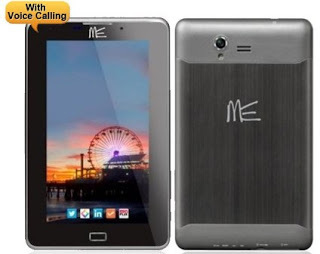 Also recently the company has launched the Me Y2 slate and tablet. 0 Respones to "HCL Me V1"